GCM Image of the Week: What is Big Data? 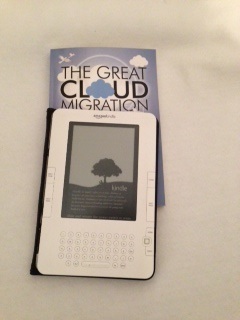 Kindle edition of the Great Cloud Migration is now available! Kindle Version of the Great Cloud Migration available in 12 hours! For those readers that have asked for a Kindle version of the Great Cloud Migration – I created the kindle version tonight! The book is currently “under review” and will be available in the Kindle store within 12 hours. Happy Kindle Reading! Excellent article by David Linthicum! GCM Image of the Week: Ever wonder where the term Cloud Computing came from? The term “cloud” originated as an analogy for the internet because network diagrams depicted the internet via a cloud symbol as depicted in Figure 4 (from my new book “The Great Cloud Migration”). Latest GCN.com article on Cloud Computing is out! This article discusses the AWS/IBM fight over the CIA cloud computing contract and why that is a watershed event in cloud computing! Enjoy! New Book is Published and Available on Amazon! Just received news from the publisher that my new book is available! I am excited about this book – it took a year to write and so far the feedback is really good! – Learn how to migrate your applications to the cloud! – Learn how to overcome your senior management’s concerns about Cloud Security and Interoperability! – Learn how to explain cloud computing, big data and linked data to your organization! – Learn how to develop a robust Cloud Implementation Strategy! – Learn how a Technical Cloud Broker can ease your migration to the cloud! This book will answer the key questions that every organization is asking about emerging technologies like Cloud Computing, Big Data and Linked Data. Written by a seasoned expert and author/co-author of 11 other technical books, this book deftly guides you with real-world experience, case studies, illustrative diagrams and in-depth analysis. How do you migrate your software applications to the cloud? This book is your definitive guide to migrating applications to the cloud! It explains all the options, tradeoffs, challenges and obstacles to the migration. It provides a migration lifecycle and process you can follow to migrate each application. It provides in-depth case studies: specifically, an Infrastructure-as-a-Service case study and a Platform-as-a-Service case study. It covers the difference between application migration and data migration to the cloud and walks you through how to do both well. It covers migration to all the major cloud providers to include Amazon Web Services (AWS), Google AppEngine and Microsoft Azure. How do you develop a sound implementation strategy for the migration to the cloud? This book leverages Mr. Daconta’s 25 years of leadership experience, from the Military to Corporate Executive teams to the Office of the CIO in the Department of Homeland Security, to guide you through the development of a practical and sound implementation strategy. The book’s “Triple-A” Strategy: Assessment, Architecture then Action is must reading for every project lead and IT manager! This book covers twenty migration scenarios! Application and data migration to the cloud can be complex! There are many paths you can take, many variations in the types of applications you want to migrate, multiple ways to migrate (like fork-lift style, or component re-engineering) to multiple target platforms (private, public, hybrid clouds). All of these paths need to be explored and weighed against your objectives. This book explores them all! You will have the confidence to tackle a migration after reading this book because you will be well prepared! This book is packed with over 80 figures! With over 15 years of training experience, Mr. Daconta knows that most people learn best through visual depictions. Graphics, images and photos make abstract things concrete and this book has 84 figures that give you those visual cues and new visual perspectives into these new concepts! Pictures Rule and this book knows that! This book is packed with 7 in-depth case studies, 3 customized definitions and over 60 examples! The 7 in-depth case studies drill down to explore all the details of an organization using and getting value out of the technology in question. You will see how they did it, learn best practices from their experience and learn how to gain those same successful results! The 3 customized definitions are designed to help you see how the parts and pieces of the concepts we define (cloud computing, big data and linked data) meld together into something useful. Each definition has an explanation, a purpose, a sample usage (or use case) and an analogy. The 60 examples are illustrate each point with a real-world experience – real world companies like Amazon, Salesforce.com, and Kaggle.com ; real-world products like Cassandra, CloverETL, and Hbase; and real-world analogies. At every major point in the book, you will see the words “For Example” and know that you will have solid experience to rely on, make decisions upon and learn from! This book delivers!